Over the past few years, the concept of “involvement” has become an increasingly hot topic amongst media executives and marketers. MIT C3’s own Stacy Wood, an Associate Professor of Marketing at the University of South Carolina, has been studying involvement (among other things), and she recently wrote an excellent article on the subject. The article isn’t publicly available, but I’d like to share parts of it with you — it is relevant to game companies as advertisers, and as developers of an advertising medium. The public release of Paul Hemp’s article on Avatar-Based Marketing has inspired me to write about something that we’ve been discussing at MIT for the past couple years. That is, reverse-placement: the idea that fictional brands can be created in games, then introduced to the physical world as real products. Also, the idea that market research can be conducted within games. Consumer product companies spend tens of millions of dollars (if not more) attempting to establish a new brand, especially in competitive retail markets. Fighting mature competitors for mindshare and shelf-space is difficult at best. Many video games, on the other hand, offer vast acres of uncluttered virtual real estate via which to introduce a new brand. And, lest I be accused of empty posturing (or wasting your time, though it’s probably too late to avoid that), here are some of my ideas for in-game ads. The key to these ideas is: A) they all “fit naturally” within the game’s environment, B) they reinforce the advertiser’s brand message in some way, C) they do not distract the player from the fun; rather, they are part of the fun. Why Would Microsoft Buy Massive? Ever since it was announced that Microsoft may acquire Massive, speculation has run rampant as to what MS is up to. Mmmmm…. speculation. I want in. Massive has the following: relationships with most major developers and publishers, a solid ad-sales group, and (presumably good) ad-serving technology. Massive’s expertise and insight has some value as well, though it’s difficult to quantify how much. Michael McHale, Senior Producer at Konami, kindly answered some of my questions about his experience working with in-game advertisements. Please describe how you made use of in-game advertising in Karaoke Revolution Party. KRP for the Xbox includes technology from Massive, Inc. If the player is logged into Xbox Live, new ad-containing textures will stream into the game. We made sure that the advertising spots appear in logical places in the game environment. We were very careful, so the ads are not constantly “in your face” and they integrate nicely with the background environment. We believe that it adds to the gameplay experience when the environment changes dynamically. Did you reach out to advertisers who you thought would “fit” the game’s theme, or did you work with advertisers who reached out to you, or both? How did that affect the design and development process? Massive’s sales team sold the ads. We retain approval over all ads before they appear in the game. The content must be appropriate for the audience (the game is rated E10+), and we expect the ad art assets to be high quality, and to fit the general art style of the game. Did you experience any conflicts with your advertisers? How did you negotiate the process of integrating their ads into the game in a highly visible but tasteful way? We created a guide that shows where the ads would be placed, with screenshots of the game environment. This hopefully helped the ad agencies. There was a set of ads that we felt did not meet our quality standards and did not fit the art style of the game, so we rejected them. What surprised you most about the process of embedding advertisements into the game? Would you do anything differently? There are currently two different types of advertisements you can run, and they each have limitations. Static ads are placed on the game disc and are visible whether you are online or offline. The issue with static ads is that you can’t track how many times they are viewed, and you can’t refresh the content, so the user sees the same ads for the life of the product. The ads have to be placed in the game months ahead of time before the game is released, so agencies can’t run ad campaigns that hit at a specific time, such as an ad for a movie release. The PlayStation 2 does not have a hard drive to store data, so static ads are your only option there. Dynamic ads can be tracked and scheduled, but the player must be online while playing the game in order to see the ads. This works well for online multiplayer games, but not as well for single player games. I expect this issue to be worked out in the future, when dynamic ads will be stored and visible even when you are offline. From the development side, the process of planning where the ads will go and integrating the ad-serving technology into the game takes time. Although the impact to our development schedule was minimal, we were still taking time that could have been spent elsewhere. Looking back at the project, I don’t think we would have done anything differently, but it would have been nice to store the streaming ads locally on the Xbox. We hope we did a good job of integrating the ad content without being too intrusive. Advertisers and their agencies understand all too well that the end user can have a negative reaction to ads if they are not integrated into any form of media in the right way. I just sat in on the “Continued Growth of Gaming” panel at the MBA Media and Entertainment Conference in New York. 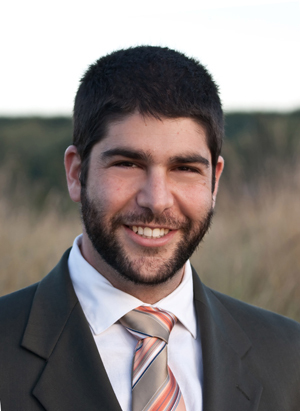 Moderator: Cyrus Beagley (Engagement Manager, McKinsey Entertainment Practice). Speakers on the panel: Greg Costikyan (Founder, Manifesto Games), Chris Di Cesare (Director of Marketing, Xbox), Nique Fajors (VP of Brand Management, Atari), Frederic Markus (President, eRelevant Games), Joseph Varet (Sr. Director of Biz Dev & Strategy, MTV Networks). I managed to catch most of what was said, except in the case of Greg Costikyan, who speaks two to three times faster than most normal human beings. Topics discussed: What makes a franchise successful, MTV’s role in the video game industry, innovation, the attractiveness of various game markets, and some questions for Microsoft about portables and shortages. Two things you can’t help but notice immediately: there are a ton of ads in a single location, and no effort has been made to realistically blend the ads into the surrounding environment. It doesn’t get more blunt than this. Some marketing professionals would argue that there’s nothing wrong with this campaign. They might say that conscious rejection of the ads will be outweighed by subconscious assimilation of the brand. They might even dismiss conscious rejection entirely. There is some research that supports these assertions, though I don’t know of any study focused on an equally blunt campaign in a AAA game. Can you imagine how people would feel if, after paying $50 per person, they walked into Disney World (expecting an escape, magic, etc), and they saw this? What if the rides themselves were filled with poorly-placed ads? Can you imagine Subway blanketing the Haunted Mansion in the same way it blanketed Counter-Strike? They’d never do it (and Disney would never permit it). 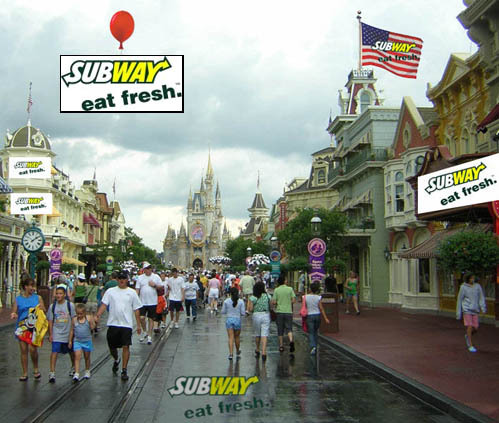 If you were a visitor to this theoretical Disney World, do you think your conscious frustration with Subway (and Disney) would fade quickly? Speaking only for myself: I’d be irate, and I wouldn’t forget it soon. There’s an extra level of thoughtfulness that must be employed when advertising in any medium that people particularly care about — and games (like Disney World) are at the top of the heap. Update (1/24): according to Jennie at Joystiq, the CS screenshot she posted was actually modified. 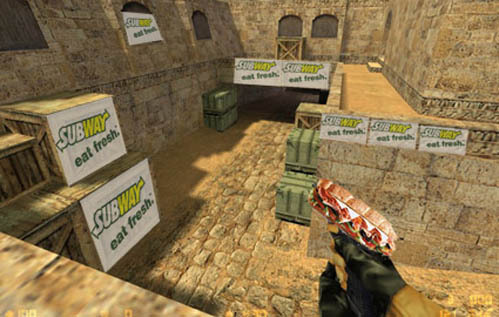 Jennie added that the actual in-game Subway campaign was slightly less “absurd”, but still “badly done for the CS setting”.